Heart valves bodies and leaflets can experience axial loading due to pressures and motion. The fatigue resistance of the valve body and/or leaflet to repeated axial loading must be tested to ensure long term efficacy. The fixture shown was designed to apply an axial compressive fatigue load to a valve body. 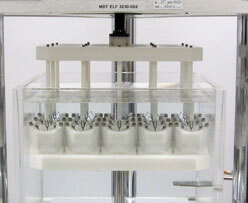 This particular fixture is designed for 15 specimen stationsand can be used in a 37°C saline bath.